Quotes of the New Zealand Dollar to US Dollar NZD/USD complete the trading week near the 0.6745 area. The pair continues to move within the framework of the correction and the formation of the «Triangle» model. Moving averages indicate a bearish trend. At the moment, we should expect an attempt to continue growth and test the resistance area near the level of 0.6840. Then, the currency pair will continue to fall with a potential target below the level of 0.6435. In favor of the fall of the NZD/USD currency pair, a test of the bearish trend line on the relative strength index (RSI) will come out. Cancellation of the option of falling quotations in the current trading week from February 11 — 15, 2019 will be strong growth and a breakdown of the area of ​​0.6995. This will indicate a breakdown of the upper limit of the Triangle model and continued growth of the NZD/USD pair. The confirmation of the decline in the currency pair at Forex will be the breakdown of the lower boundary of the «Triangle» model and the closure of quotes below the 0.6555 area. Among the important news from New Zealand that may have an impact on the New Zealand Dollar rate, it is worth mentioning: The decision of the Reserve Bank of New Zealand on the basic interest rate, the accompanying statement of the Reserve Bank of New Zealand, Press Conference. 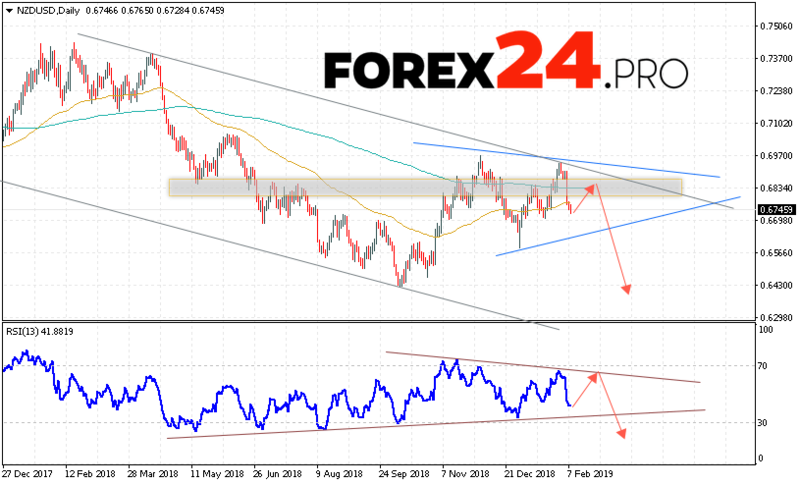 NZD/USD Forecast and Analysis February 11 — 15, 2019 implies an attempt to test the resistance level near the area of ​​0.6840. Further, the continuation of the fall of the pair NZD/USD to the area below the level of 0.6435. An additional signal in favor of reducing the test trend line on the indicator of relative strength index (RSI). Cancellation of the option of falling of the pair will be a strong growth and closing of the NZD/USD quotes above the level of 0.6995. In this case, we should expect a continuation of the climb.